Mykonos is probably best known for combining jet-set vacations, with high-end partying and relaxing in luxury but with a more rustic feel than, let’s say, its contender, Saint Tropez. Mykonos was one of the first island to see touristic development and has been a top destination since the 1960’s. It combines cosmopolitan aura and amenities of a high-profile destination, all the while maintaining its tradition. By walking through the picturesque cobblestone streets of the Chora, you will see the locals’ shops and their places of abode, providing a contrast which enhances the experience of travel. The locals are very warm hearted, something which is common for the Greek mentality. 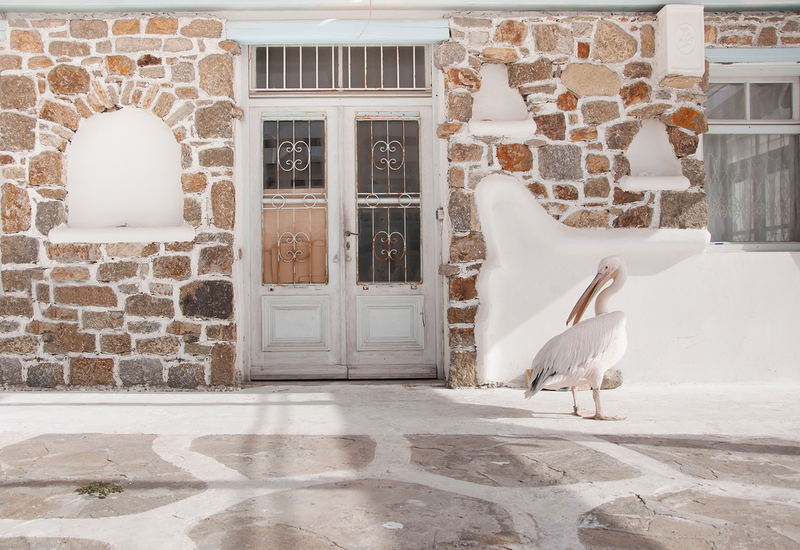 Look out for Petros Jr. the Pelican somewhere amidst the locals; he is the younger mascot of Mykonos, after the death of Petros Sr., and he loves to pose for photographs with tourists. The nightlife is exceptional and worldly renowned. The island is buzzing during all hours, as most nightlife does not stop when the sun comes up and the parties begin as early as just after noon on the beaches. For example Paradise and Super Paradise are in constant party mode. The most famous beach is Psarou, where you probably need to book your sun-beds in advance in order to guarantee a place to lie in the sun here. Chances are you will be lying next to a celebrity if you do. All your catering needs are in the good hands of the Nammos restaurant/bar which has many spectacular options from which to choose from and even provides Yoga sessions on the beach or indoors ‘Hot’ Yoga. Other popular beaches are Elia, Kalo Livadi and Ornos. They all have the same characteristics in terms of the beach landscape, that is, white sandy and crystal azure water, and your preference should depend on how you want to enjoy your day: partying, relaxing or somewhere in between. There are choices for each of these. The most colourful part of the island is undoubtedly Little Venice, which is also a very romantic setting for a beautiful sunset and a delicious cocktail. It is called this because of its resemblance to the Italian Venice, as all the buildings are literally on the waterfront. 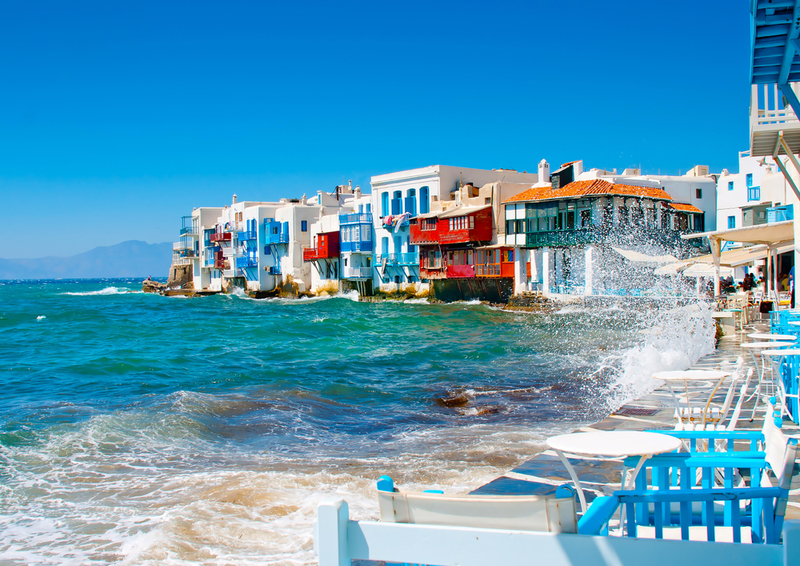 Be prepared for a lot of people during the high-season months of July and August, as well as expecting it to be a bit windy since the ancient Greek name for Mykonos is ‘island of the winds’. 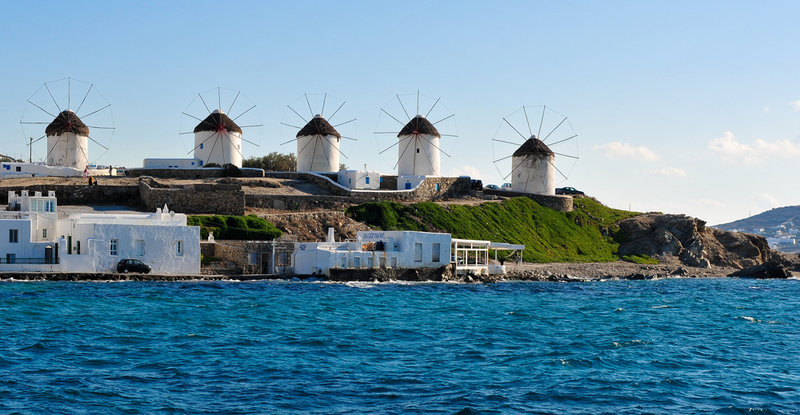 Hence you will see the numerous iconic windmills that can be seen from anywhere in the Chora, seven of which are strewn across the horizon of the Chora’s highest point, and the rest dispersed throughout the island.